The BC Road Safety Strategy has a lot of good recommendations that if implemented, would make our roads much safer for everyone cycling, walking and driving. Unfortunately, the vast majority of policy measures have not been implemented and infrastructure changes have not been made on the scale needed to make much of a difference. Not surprisingly, the result has been increased crashes and higher ICBC rates. It is time the BC Government got really serious about road safety. One key measure that we strongly support is reducing driving by providing people with excellent cycling, walking and transit choices. Sadly, the government has been underinvesting in cycling, walking and transit for decades giving many no reasonable cycling, walking and transit options. Slower speeds decrease the number and severity of crashes and are especially important to make our reads safer for people walking and cycling. Doubling the number of roadside breath tests and significantly increasing penalties. Tell them about your close calls or crashes. Let them know you want transportation choices; more enforcement of drunk and distracted driving laws; automated speed enforcement; and lower speed limits to help protect you and your loved ones. Yes. I Want Safer Roads in BC! Thank You for Supporting a Safer Roads in BC! Thank you for supporting safer roads for everyone cycling, walking and driving BC. Your letter really helps! Please join me in helping to make BC safer for people who cycle, walk and drive. Send a email to let the Premier and Ministers know you want transportation choices; more enforcement of drunk and distracted driving laws; automated speed enforcement; and lower speed limits to help protect you and your loved ones. Yes. I support Safer Roads! More good news from the UBCM Conference! The mayors and councillors passed a resolution in support of using average-speed-over-distance or point-to-point speed enforcement to improve safety on roads including the Sea-to-Sky Highway 99 at Lions Bay, the Malahat Highway 1 or the Coquihalla Highway 5. The high motor vehicle speeds make cycling on these critically connections unsafe and uncomfortable. Please email the Premier in support speed enforcement on dangerous highways. Resolution B103 Reducing Excessive Driving Speeds in Designated BC Road Safety Corridors, For All Drivers, All The Time, states: Whereas the correlation between excessive speed and road accidents is well accepted, and the high human and economic cost to British Columbia is well understood; And whereas average-speed-over-distance or point-to-point technology has proven extremely effective in jurisdictions worldwide at controlling road speed for all drivers all the time in designated road safety corridors: Therefore be it resolved that the provincial government be requested to pilot average-speed-over-distance technology at one or more suitable locations in BC, including but not limited to the Sea-to-Sky Highway 99 at Lions Bay, the Malahat Highway 1 or the Coquihalla Highway 5. Thanks to Lions Bay for moving this resolution forward and to all the mayors and councillors who voted for safer roads! More information here. Using red light cameras for speed enforcement should help make intersections significantly safer for people walking and cycling. This is particularly important as those walking and cycling represent 38% of fatalities at intersections according to the Provincial Health Officer (Reducing the Impact of Motor Vehicle Crashes on Health and Well-being in BC page 125). For example, according to the City of Vancouver Cycling Safety Study (page 47), 48% of cycling crashes on designated bike ways and 34% of crashes on arterials happen at intersections. As more protected bike lanes are built around CB, the percentage of cycling collisions at intersections will increase. 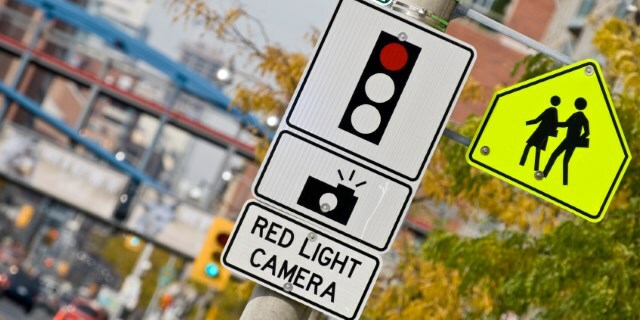 The good news is that the BC Government is upgrading red light cameras to catch speeders at dangerous intersections. The BC Cycling Coalition strongly encouraged this in our letter of July 2017 to Attorney General Eby. However, the BC Government need to ensure vehicles are travelling slow enough to prevent fatal crashes with cyclists and pedestrians. Of concern is the following statement by Attorney General Eby: “These are fixed cameras, you can put up a big sign that says if you speed through this intersection at 20 kilometres an hour or more, you’re going to get a ticket guaranteed,” Even crashes at speeds of 50 km/h are likely to be fatal to those cycling and walking so the slower the better. If the speed limit is 50 km/h, 20 km/h over is 70 km/h. Still way to fast to avoid serious injuries or fatalities especially in crashes involving people walking and cycling. The Government should consider at least a small fine for even 5 km/h over the speed limit at intersections popular with people cycling and walking and even better, lower the speed limit to 30 km/h. Please Write the Premier and Ministers supporting the use red light cameras for speed control and encouraging them to lower the speeds enough to prevent cycling and walking fatalities. Average speed cameras that track speed over a section of road have dramatically reduced fatal and serious crashes in Scotland. A much better idea than capping minor injury that would save lives and reduce ICBC's costs. Municipal leaders called on the BC government to allow them to use speed cameras on local roads. Automated speed enforcement has proven to be effective around the world at lowering crashes, injuries and fatalities. Please write the Premier. Please Premier. Help Save Lives!! Using red light cameras for speed enforcement on green would make roads safer for everyone. Please write the Premier!